Morgan Electro Ceramics (MEC) one of the world’s leading manufacturers of technically advanced ceramics have chosen Hampshire Mezzanine Floors to modernise their Southampton factory offices. Hampshire Mezzanine Floors, the Southampton based refurbishment main contractor has recently refurbished 2 floors of the MEC factory offices. The revamp involved the complete refit of the company’s conference and meeting facilities as well as extensive office and Engineering area. High efficiency energy saving invertor air conditioning systems were fitted by HMF to both heat and cool the building. Modular demountable and relocatable partitioning was provided by HMF to allow MEC to maintain long-term future flexibility. The flooring chosen was a mixture of hardwearing modern wood effect vinyl and also hardwearing carpet. 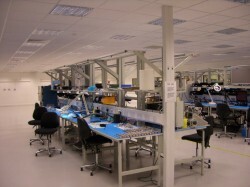 The electrical installation included modular lighting systems. The overall working environment has been transformed making this office a pleasant and comfortable place to work. HMF have been working on projects for Morgan Electro Ceramics for over 15 years and are delighted to have been chosen for this prestigious project. HMF have recently completed this Southampton site upgrade.